My iPhone homescreen as of November 2017. This post orignally appeared in the Club MacStories Newsletter). A lot of things have changed for me since I last shared my Home screen in 2015. Last year I switched to Android, using a Pixel XL as my phone because I had become frustrated with some of the interface changes to iOS. Just under a year later I was as irked with Android as I previously was with iOS, but for different reasons (Seriously Android? No way to choose audio output is ridiculous). I also missed my Apple Watch and I wanted to try out AirPods which, surprising no one, I love. One of the things I did like about Android is that every app you install doesn’t have to be on the Home screen. I got pretty use to this so I now have my most used apps on first screen, everything else in a folder on the second, and I use spotlight to find those apps. 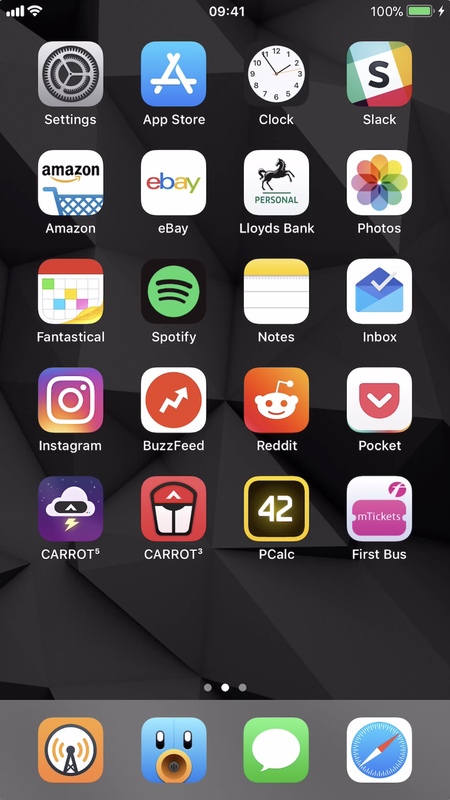 This did have its downsides on Android though; some apps I would simply forget to check, or post to, so I’ve made an effort to put those apps on the Home screen on my iPhone, namely Instagram, Reddit, and Buzzfeed. Starting with my dock, Overcast and Tweetbot were the apps I missed the most. The plethora of great podcast, and to some extent Twitter, clients on iOS isn’t mirrored on Android and Pocketcasts is basically the only decent option. As much as I like Pocketcasts, Overcast works better for the way I like to listen and subscribe to podcasts. I do still have Pocketcasts and Castro installed so I can check out any new features and switch easily if I want to. Mac counterparts isn’t something offered by a lot of Android apps so coming back to iOS I was happy download Fantastical and PCalc although the latter isn’t as much a calculator for me as it is a game that can also do calculations. Before I used Android I was a plug-in-and-sync-from-iTunes person but I signed up for Spotify the day I got my Pixel and I’ve been using it ever since. I have considered Apple Music but it doesn’t integrate with my Amazon Echo so that’s a no-go, at least for now. The rest of the apps are fairly self-explanatory; Amazon, eBay, and my bank’s terrible app because I buy a lot of Lego, Google Inbox because email is a necessary evil, and notes because I like the simplicity of it. Spending a year on Android gave me an appreciation for the things I really like about iOS as well as the areas I hope they improve on in the future like the Home screen layout and notifications.